Determined • Run Hard. Rest Well. Listen to this with all your heart. What will you do this week to re-live it? To make it your own? Sometime, in some way this week, make your way to Golgotha. Sometime, in some way this Sunday, visit the empty tomb. Go outside. Feel the wind in your face. Watch the sun rise or the sun set. There, face-to-face greet God with a shout of joy. 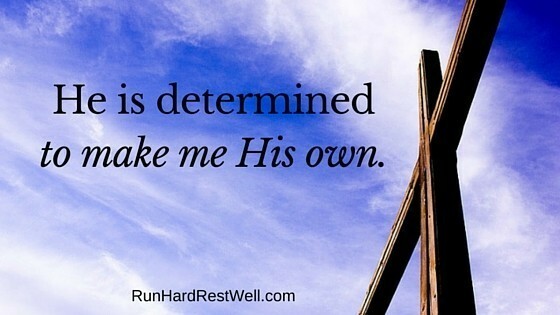 God is determined to make me His own. May I, with great determination—framed and founded on grace, be determined to make Him mine. Thank you for the reminder! Love all of you!! Hi Mom and Pop — Thank you! He has Risen. He has risen, indeed! I am headed to a Lake Placid Christian Conference Center in Hartford City for Friday evening and all day Saturday for a retreat of silence. Liz – God’s richest blessing. God does amazing things when His people meet Him at the foot of the cross … and He does amazing things in Quiet Places. In some ways Passion Week will pass without me. I’m not able to go to church right now. The Lord is speaking loudly and clearly to me, though. When I worked, my busyness kept me from thinking on each day….each step closer to the Skull. Now…I agonize through each day. I’ve watched Him as He cleansed the temple. I have allowed Him to wash me too. I see Him as He is proclaiming Truth. I am listening. There is a song that talks about when I see Him….will I bow or stand, speak or be silent, sing, dance…I can only imagine. Ressurection Sunday….I won’t be caught up in the celebration…..but I wonder….will I stand in awe at the empty tomb? Will I seek His body? Will I be fill with great rejoicing? What will the Holy Spirit do in me? I can only imagine. Oh dear one – What will the Holy Spirit do in all of us this week?! We can only imagine. May these days continue to be those of Sacred Celebration. This prayer came from a prayer warrior and RHRW partner, Betty from Texas. May it become our own. “Lord, it’s time. People will be getting off work and preparing for tonight. Will they go? How tired are they? What do they want to do? Lord, call out to Your children throughout this country. Call them to walk with You. Open their hearts and minds to hear Your prayer….Your prayer for the disciples and for us. Call us to walk with You into the Garden. Call us to watch with You for one hour. Watch and pray. Lord, this night….this day….this time….call us to pray for our nation. Lord, this election time is full of wickedness. People throw words out that wound, maim, kill. Call us to pray. Soon You will come again. We must watch. We must pray. Lord, allow us to hear. Deep in our hearts the agony of this prayer. The hope. The life. The comfort. Lord, open our hearts. Call Your people to join together in worship, remembering You and the last supper You shared with You disciples…Your friends. This was the Passover. This meal meant everything, but the words seem to give this night a commonness instead of a specialness. Lord, we become comfortable and make the rituals lose their significance. Forgive us. The rituals….the liturgy…..the repetition, is there for us. It calls us to remember. It calls us to celebrate again what You did for us and in us. Lord, do not allow us to call that which is sacred as common. Lord, this is a travesty. Remind us of the stories. Remind us of what You have done for us all. Lord, You called us to come. Enable us to come. Open the doors and windows wide. Call out to Your children…..come. This night. Lord, may we watch. This night, Lord, may we pray. Send Your Spirit and alight on us anew. Open our eyes. This night will never again be repeated. Let it be a night to remember. Call out to us.